Micro inverters are used in over half of all solar installations in North America and are the most popular alternative to the common 'string' solar inverter. Micro inverters, also known as micros, have several advantages over string solar inverters but a slightly higher upfront cost. In this article we examine whether it is worth paying extra and what specific advantages micro inverters have over common string inverters. For those new to solar learn the basics of how solar works here. A micro inverter is as very small inverter designed to be attached directly to one or two solar panels. This is different to a common string solar inverter which is usually located on a wall some distance from the string of solar panels and connected via DC cable; DC power from the string of the panels is then converted to AC at the inverter. Micro's however are attached to each individual panel which means each panel works independently from the rest of the solar array and DC power is converted to AC immediately on the roof. Some solar panels are available with factory installed micro inverters these are referred to as AC solar modules which we discuss in detail later in this review. Note most benefits of micro inverters only apply to high quality micro inverters such as those from Enphase. Unknown or poor quality micros should be avoided due to the history of high failure rates and poor service. Enphase recently purchased Sunpower microinverters (previously SolarBridge) and will now supply Sunpower with enphase micro's. Despite these performance issues micro inverters allow all panels operate at their maximum power point and not be effected the other panels. A big advantage of micro's is the ability to locate panels on multiple sections of a complex roof layout with different orientations and tilt angles. Unlike string inverters, micro inverters are not restricted to panel placement in one or two different orientations. Micro inverter systems also have no single point of failure, which is particular important in a large system with many panels. This means that unlike with string inverter systems, if one panel or micro inverter has a serious fault the rest of the system is unaffected and it doesn't result in complete loss of generation. Enphase Energy have a family of micro inverters and have recently released the IQ7 and IQ7+ which is the seventh generation micro inverter from what is widely known as the leading micro manufacturer. Micro inverters offer better system monitoring than (non optimized) string inverters as each panel can be monitored individually. For common string inverter systems additional panel mounted 'DC optimizers' such as those from Tigo or SolarEdge can also enable individual panel level monitoring and optimisation. With micros or optimisers an owner can see the performance of the system as a whole, plus at the individual panel level. Also the installer can have a separate login where they can monitor all their systems at a panel level and are warned when any panels are under-performing which can prevent system downtime and help with any warranty claims. Enphase Energy have the Envoy monitoring hub for all systems to enable setup, commissioning and remote monitoring. Enphase also monitor all systems worldwide from their headquarters in the US. This allows an excellent opportunity to monitor fault conditions and continue to improve their product. Most micro inverters, including the leading manufacturer Enphase have been rigorously tested in extreme weather conditions. These units are designed to last the life of a solar panel, and generally have a warranty to back that up. Many micro inverters come with a 25 year warranty compared to a standard 10 years for most string inverters. Again, bear in mind that this is only relevant with high quality micro inverters. A poor quality micro inverter with a 25 year warranty is not worth the hassle of having to deal with failures on a regular basis. APsystems are another large micro inverter manufacturer although in the past industry specialists and solar installers have reported much higher failure and reliability issues compared to Enphase. We do not have much feedback on the performance on the new generation micros from APsystems. Enphase tested and monitored the performance of their micro's during the 2014 Australia summer in Adelaide which had the most consecutive days over 40C (104F) in its recorded history and peaked at 45.9C (115C). Because of the advanced monitoring of their inverters, they were able to announce that “No Enphase Micro inverter across Australia shut down due to temperature” during this period. SolarBridge also has very stringent testing of their inverters and have performed well in hot and freezing temperatures. It cannot be inferred that all micros are up to this standard though and there are several brands including APsystems (APS) which have recorded much higher failure rates by installers. In a rooftop string inverter system DC electricity is sent from the roof top, usually through roof or wall cavities to an inverter which then converts the DC electricity to AC electricity. Unlike common string solar systems when single module is damaged it cannot turn into a dangerous hot spot which can happen with strings as the higher voltage and current can cause a thermal runaway. In a micro inverter system panels still produce DC power but it is converted to AC immediately, right on the roof. This is important because it is voltage from DC electricity that is more likely to cause arcing when a cable is damaged, which in turn can lead to heating and a potential fire. It is very important to bear in mind that fire from any solar system is very unlikely, especially if correct installation methods are taken. Micro inverter manufacturers argue that whilst the upfront cost of their technology is higher than string inverters, they are better value over time. It stands to reason that if micros allow for greater performance and output of your solar system and are more reliable, then over time they will have a better pay back. Whether they do and if so by how much, depends on many factors including; difference in cost to string inverter system, shading and soiling of system, and electricity tariffs. AC solar modules (panels with factory attached micros) have some advantages to add-on micros. SolarBridge was considered the leader in AC modules but was acquired by the highly regarded solar panel manufacturer SunPower in 2014 and since only limited AC modules are available using the now SunPower micros. More recently Enphase has taken to developing AC modules again and teamed up with two world leading solar panel manufacturers LG Energy and Jinko Solar. The new 7th generation IQ series from Enphase have being specifically designed for integration into AC modules and will be available in 2018. A significant advantage for installers is the speed at which they can install AC modules. As the inverters have already been mounted to the panels, installers simply need to lay the panels on the roof and plug them together. As the micro inverter is integrated into the panel there are also less points of failure and the micro has usually been optimised for the particular panel it is assembled to. This is generally more reliable with less handling can also translate to installation cost savings for consumers. A factor that must be considered when looking at micro inverters is that there are far more inverters in one solar installation than with a string inverter. 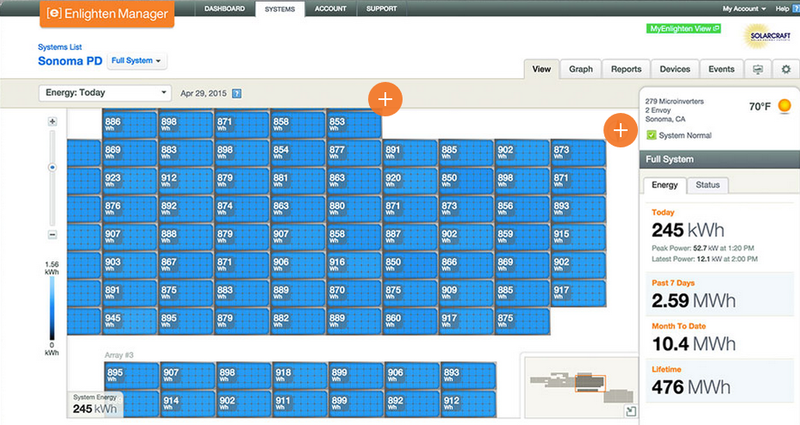 In a 5kW system using 250W panels and micros on each panel, there will be 20 inverters. Which means that if the micros being used have the same failure rate as a mid range string inverter, there is 20 times more chance of a failure than with that string inverter. So, if you decide to use micro inverters you should always use the best quality such as those from Enphase or Sunpower (AC modules) simply because you cannot afford for them to fail as often as a mid range string inverter. This brings us to the second point; cost. The upfront cost will be slightly more expensive as mentioned before. On smaller sytems (2-3kW) micros are less of a premium than string systems, because instead of having one string inverter you have 8-12 micros. Although on a 5kW system, the cost difference becomes greater as one single string inverter becomes significantly cheaper than 16-20 micro inverters. The final and most obvious reason why micro inverters may not be the best choice is due to the mounting location on the roof where they are generally exposed to extreme heat, humidity and potentially salt mist when located near the ocean. This is where string inverters have the big advantage of being mounted in more protected locations or even indoors. Most micro inverters are tested and built for these weather extremes, but over the years some micro inverters have had multiple faults especially when in harsh conditions such as high humidity and in close proximity to the ocean with extreme salt corrosion. Unfortunately many battery storage systems on the market cannot be used together with micro inverters. Since most battery systems are DC coupled you need a compatible hybrid string inverter or multi-mode inverter. Because micro inverters output AC power these cannot be used with the common DC battery systems, however they can be used with AC battery systems. Enphase Energy manufacturer a compact 1.2kWh AC battery module which is compatible with the Enphase micro inverter system and can be managed through the Enphase Enlighten portal. This unique modular system can be expanded if required and since it communicates with the Enphase Envoy it enables a complete range of load shifting and demand management features. The only disadvantage of the Enphase AC battery is (at this stage) it cannot be used as a back-up power supply. Fortunately there are several popular AC batteries now available which have backup capability including the Tesla Powerwall 2. There are many advantages to using micro inverters and AC modules in particular when individual panel level monitoring is required, however you should only use the best quality units. For smaller systems up to 4kW micro Inverters only have a slightly higher upfront cost compared to string inverter systems but this can be increase considerably for larger systems. If you are on a very tight budget and have large open roof area's with no shading issues then a good quality string inverter is going to be more economical. Also if you prefer a DC coupled battery system or you are installing off-grid then micro inverters are not really suitable. If you are looking for a quality, safe and high performing system with great monitoring, then high quality micro inverters from Enphase or Sunpower AC modules should be considered. If your roof has multiple aspects or shading issues micros will also offer many advantages. For commercial systems with many roof pitches, obstacles or where monitoring performance is required micros can offer a greater payback over the life of the system. Micro inverter manufacturer Enphase is considered an industry leader. As is evident from this article our favorite micro brands is Enphase. This is because not only do they market themselves better but they have a very solid track record and good service. Remember, for the reasons I have mentioned above, micro inverters need to be of the highest quality. Whatever you choose ensure the units have been rigorously tested in extreme conditions and the company has a very strong track record. If you are also in the market for a large battery system for load shifting or back-up power supply then micros will limit the battery options you can use. Also many of the AC battery options cannot work during a blackout so you will have to weigh up whether a back-up power supply is critical or just a convenience.